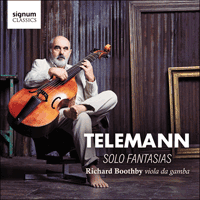 One of the greatest early-music 'finds' of recent times, Telemann’s fantasias for viola da gamba reveal some of the composer’s finest writing for solo instrument, by turns virtuosic and expressive. The viola da gamba is a most remarkable instrument: it has had a continuous history from its development at the end of the fifteenth century to the present day and has adapted to the changing musical fashions with surprising ease. It was developed from the vihuela, an ancestor also of the guitar, in Spain in the last part of fifteenth century, and came to Italy in 1492 with the election of the second of the Borgia popes, Alexander VI. While Rodrigo de Borgia was known as a notorious libertine, fathering several children with his many mistresses, he was also a cultured man who loved music, and in his retinue were several players of the vihuela d’arco. This term was Italianised to ‘viola’ and ‘da gamba’ added to distinguish it from the emerging violin family instruments, played ‘da braccio’ or on the arm. Initially, this new instrument played vocal polyphony in consorts of three, four, five and six parts, perhaps from the newly invigorated printing of music in Venice by Petrucci. But Its potential as a solo instrument was quickly realised and the first publication of solo music came in 1542 in Venice. Having six strings (and later seven) and tuned in the same way as the lute gives the instrument the ability to express both lyrical melody and harmony with chords, and many composers sought to combine both elements. For the most part, composers of solo music have been virtuoso exponents of the instrument, such as Diego Ortiz (1553), Tobias Hume (1605), Rognoni & Dalla Casa, William Lawes, Marin Marais, Antoine Forqueray and his son, Johann Schenck (1675), De Machy (1685), and Abel (1780s). To this list we can now add Georg Philipp Telemann, who wasn’t a viola da gamba virtuoso, but who played the instrument well enough to be able to write idiomatically for it—as he did for many other instruments. Telemann has a reputation—and an oddly negative one—for being almost pathologically prolific. Yet his friend and contemporary, J S Bach who was almost as energetic a composer, doesn’t suffer a similar slur. In fact, in their lifetimes, Telemann was the critics’ choice and was famously the first in line for the post of Thomaskantor in Leipzig when the post became vacant in 1723, Bach being third. In his lifetime, he was widely regarded as Germany’s leading composer and kept entirely up to date with musical developments, forging important links between baroque and classical styles. Part of his fame came from being his own publisher, and an inventive and enterprising one at that. Not only did he write the music, but he personally engraved the plates as well, claiming he could complete nine or ten a day. Between 1725 and 1740, he issued no fewer than 43 publications. Many of his publications came out in weekly or monthly installments, encouraging the public to continue buying until the particular work they wanted was complete. His facility in writing idiomatic instrumental music for almost all instruments then in use was legendary, and we can hear that clearly in his writing for the viol in these fantasias. In 1728 Telemann had started the first music periodical, Der getreue Music-Meister, which appeared every fourteen days, and which contained all sorts of music, not all of it by Telemann. And he included a sonata for solo viola da gamba, very idiomatically conceived for the instrument and surely a model for these twelve fantasias. In the 1730s, he became very interested in the possibilities of writing for a solo instrument without any bass. In this, he may have been influenced by Bach’s solo sonatas and partitas for violin and the suites for ‘cello, and also a large body of German music in the seventeenth century for unaccompanied violin and viola da gamba. He published a set of twelve fantasies for solo flute in 1732, each in a different key in ascending order, and then a couple of years later a similar set for violin, again all in different keys, but without the ascending format. The same year, he published another set for viola da gamba, in the same format as the flute set, with (mostly) ascending keys, but starting at C.
It is noticeable that it is for these very instruments that Telemann was to frame his most accomplished chamber music, the so-called ‘Paris Quartets’, for violin, flute, viola da gamba (or ‘cello) and continuo. And when he travelled to France in 1737 to present these works, he was ecstatic at the abilities of the great French virtuosos who played them: Guignon, Blavet, Forqueray & Eduoard. Perhaps he already had Jean-Baptiste Antoine Forqueray in mind when composing these fantasies? The viol fantasies were dedicated to Pierre Chaunell, a prominent and wealthy Hamburg business man, whose Huguenot family had fled France at the revocation of the Edict of Nantes in 1685. The title page of the publication is in French, and the dedication suggests that Telemann thought of these works as in the French style, and his love of French music was to lead to his visit to Paris a few years later. While the first two sets of solo fantasias were known and reprinted several times, the set for viol was lost. This may suggest that fewer people bought the set; yet, Telemann had a keen idea of what was economically feasible and would not have written, let alone published music that wasn’t going to sell. So this tells us that there were many extremely competent amateur viol players in the German-speaking world and beyond. Then, in the year 2000, Schloß Ledenburg, a castle near Osnabrück, donated a large collection of music to the State library. It was a vast collection and it took fully ten years for librarians and musicologists to sort through and catalogue this music; it was only then that it became clear that a lone copy of Telemann’s viol fantasias was amongst this treasure trove. In 2015 it was announced that it had been found and that a new publication would be issued the following year, together with a recording; and they were first performed during the Mecklenburg Telemann Festival in March 2016. It is remarkable that the solo bass viol, already having such a large repertory (without mentioning the chamber music or the consort music) finds itself enriched even more with a large body of important and excellent works by a leading composer of the high baroque. And what works they are! by turns virtuosic and expressive, Telemann uses all the techniques of the instrument to create satisfyingly complete fantasias that are full of diversity. He exploits the character and the possibilities of each key, using more chords in the home keys—G, D, C and so on—and employing a more melodic style in those more remote keys. No viol player can be anything other than thrilled that we now have twelve beautiful and excellently composed ‘new’ works by the great Telemann.